I’ve been hiding a (growing) secret these past few months. At first, I was too sick to tell you. I could hardly stand, much less type. I was surviving on rice cakes and ginger ale and the mere mention of anything fried or buttered or lacquered with mayonnaise made me run for the porcelain throne. I couldn’t cook a thing. The rest of the family survived for weeks on fruit and takeout and the generosity of family and friends who showed up at our door with whatever they had to spare. If you haven’t guessed yet, I’m pregnant! and due just before Halloween. At 25 weeks, I’m feeling great and cooking up a storm, but practicing efficiency in anticipation of the nuthouse we’ll soon have. For now, since it’s summer, I’ve been grilling tons of meats and vegetables on the weekends, assembling main dishes with hot ingredients the first night, and then turning the same ingredients into cold salads or soups or pasta dishes throughout the rest of the week. This week I marinated and grilled plenty of chicken breast with foil-packet potatoes and other assorted vegetables. The second night, we chopped up the leftovers and ate them cold, over mixed greens tossed with Buttermilk Chive Dressing and called it Cobb Salad. 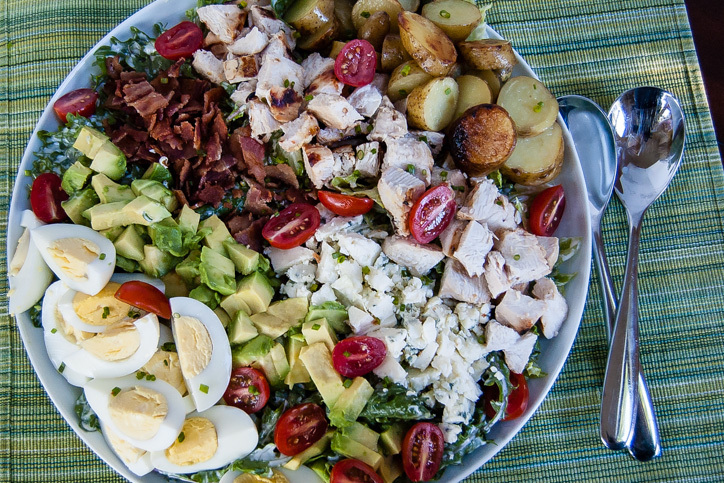 In my ideal salad world, crunchy greens are piled high with hard-boiled eggs, creamy avocado, crisp bacon, ripe grape tomatoes, salty blue cheese, creamy leftover potatoes and marinated, grilled cold chicken. 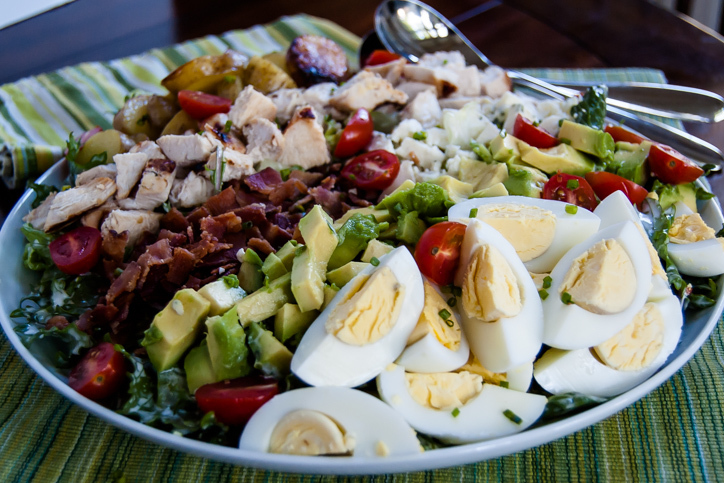 If you adore Cobb salad too, this is a pretty tasty variation to follow to the letter. But maybe in your world this becomes more of a chopped salad, with beef, lamb, or tuna steaks, leftover kernels of corn shaved from the cob or canned chickpeas, grilled eggplant and even feta cheese instead of blue, all tossed with creamy, versatile Buttermilk Chive dressing that works with just about anything in your refrigerator. This salad is easy to adapt to a variety of ingredients and even easier to multiply for an unexpected lunch or dinner crowd. The key, though, with this sort of chopped salad, is to dress the greens lightly before layering everything else on top. 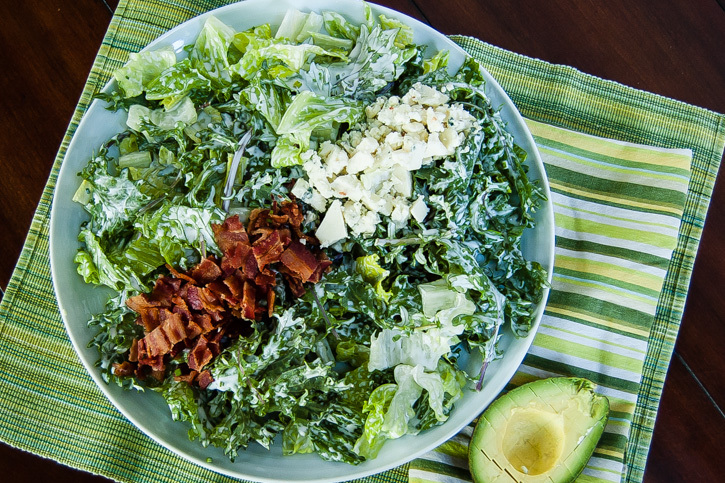 This jazzes up the dullest component, so the greens can compete with the bacons and blue cheeses of the world. Feel free to pass additional dressing at the table for guests to drizzle on as desired. As a side note, if I could eat only one component of this salad, it’d be the cold grilled potatoes drizzled with buttermilk dressing. 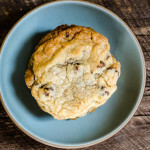 It tastes like a combination of Belgian frites dipped in mayonnaise and baked potatoes with chive sour cream all rolled into one. The chicken and potatoes can be grilled, eggs boiled (but not peeled) and dressing assembled up to 2 days in advance. If I’m grilling the chicken breast specifically for this recipe, I marinate it for 4 to 8 hours first, preferably with a simple combination of 1 part lemon juice to two parts olive oil, a few cloves of peeled, crushed garlic (I find that two cloves per breast does the trick), and several grinds of fresh black pepper. If cooking marinated chicken, light the grill and remove it from the refrigerator. Chop the potatoes into 1 to 2-inch pieces or rounds depending on the shape, and combine them in a medium bowl with 2 tablespoons olive oil and ½ teaspoon salt. When they are well-coated, pour the potatoes onto the middle of a 12x18-inch sheet of aluminum foil. Bring the two long sides to the middle and fold down twice, forming a packet. Fold up the two remaining sides to seal the packet. 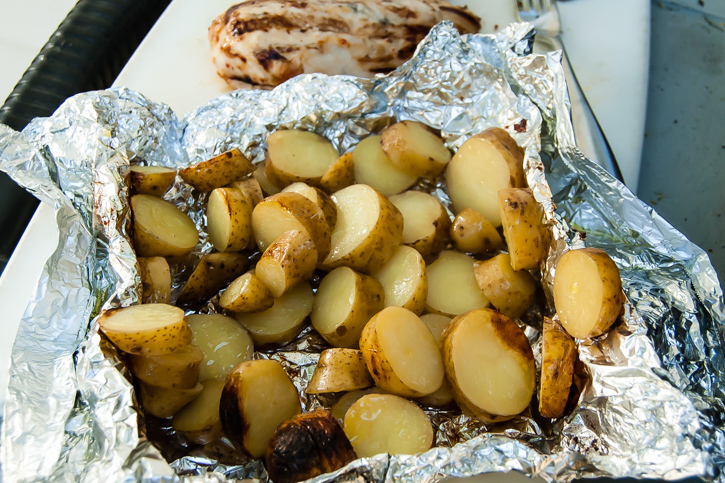 Try to make narrow folds so the packet is as large as possible and the potatoes sit in a single layer on the grill. Salt the chicken liberally on both sides and grill the chicken and potatoes over medium heat (about 375 degrees) for 8 minutes. Flip both, using a spatula, careful not to poke a hole in the foil potato packet. Repeat for 8 minutes on the other side. Remove the chicken and potatoes to a platter to rest. Open the foil packet but let the potatoes cool slightly before you try to remove them from the foil. Once the potato crusts have had a few minutes to harden, they’ll be easier to flake off the foil and less inclined to stick. Meanwhile, boil the eggs and make the dressing. Place the eggs in a small (1 to 2 quart) saucepan. Fill the pan to 1-inch above the eggs with cold water. Cover and bring up to a boil over medium-high heat. Remove from the heat immediately and let sit, covered, for 12 minutes. After 12 minutes, pour out the hot water and add cold water and ice to the pan to chill the eggs and stop the cooking. Peel and quarter each egg, or hold in the refrigerator, unpeeled, for up to a week. In a small bowl, combine the lemon juice, salt, and pepper and whisk to dissolve the salt slightly. Add the buttermilk and mayonnaise, whisking to combine. Gently fold in the chives. 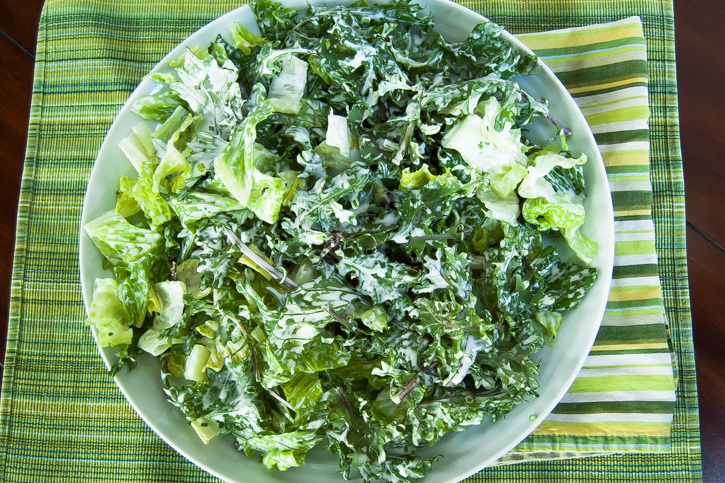 Dress the greens to taste with the dressing. Assemble on the bottom of a large platter. Chop the chicken into bite-sized 1 to 2-inch pieces, crumble the bacon and blue cheese, halve the tomatoes, peel and quarter the hard-boiled eggs, and chop the avocado into 1-inch pieces by first removing the pit and scooping out the flesh. Arrange each ingredient in a line on top of the greens, alternating as you see fit by color and size. I like to put the heavier ingredients like eggs, potatoes, and chicken on the outside and fill the middle with smaller and more delicate ingredients like bacon, blue cheese, avocado, and tomato. 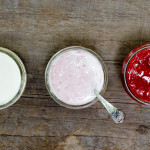 If you have buttermilk on hand (say, after making Basic Buttermilk Pancakes) great! Otherwise, combine 1 cup of milk with 1 tablespoon of lemon juice and let it sit for five minutes before stirring into the dressing. Yum! Just pinned on my dinner board! Yummy Steph!! Can’t wait to try this! So good! 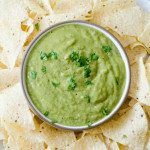 No leftovers from that – the dressing is especially delicious! I’m going to make this salad this week. Looks so good!